The English yacht Mignonette was a 19.43 net tonnage, 52-foot (16 m) cruiser built in 1867. It was an inshore boat, not made for long voyages. In 1883, she was purchased as a leisure vessel by Australian lawyer John Henry Want. The yacht could only reasonably be transported to Australia by sailing, but she was a small vessel and the prospect of a 15,000-mile (24,000-km) voyage hampered Want's initial attempts to find a suitable crew. She finally set sail for Sydney from Southampton on 19 May 1884 with a crew of four: Tom Dudley, the captain; Edwin Stephens; Edmund Brooks; and Richard Parker, the cabin boy. Parker was 17 years old and an inexperienced seaman. On 5 July, the yacht was running before a gale, around 1,600 miles (2,600 km) northwest of the Cape of Good Hope. Though the weather was by no means extreme and the vessel was not in any difficulties, Dudley gave the order to heave to so that the crew could enjoy a good night's sleep. As the manoeuvre was completed, and Parker was sent below to prepare tea, a wave struck the yacht and washed away the lee bulwark. Dudley instantly realized that the yacht was doomed and ordered the single 13-foot (4 m) lifeboat to be lowered. The lifeboat was of flimsy construction, with boards only 0.25 inches (6 mm) thick and was holed in the haste to get it away. Mignonette sank within five minutes of being struck and the crew abandoned ship for the lifeboat, managing only to salvage vital navigational instruments along with two tins of turnips and no fresh water. There have been various theories about the structural inadequacies of the yacht that led to such a catastrophic failure in routine weather. Dudley managed to improvise a sea anchor to keep the lifeboat headed into the waves and maintain her stability. Over the first night, the crew had to fight off a shark with their oars. They were around 700 miles (1,100 km) from the nearest land, being either St. Helena or Tristan da Cunha. Dudley kept the first tin of turnips until 7 July when its five pieces were shared among the men to last two days. On or around 9 July, Brooks spotted a turtle which Stephens dragged on board. The crew were resolutely avoiding drinking seawater as it was then universally held to be fatal and, though they devoured the turtle, they forewent drinking its blood when it became contaminated with seawater. The turtle yielded about three pounds (1.4 kg) of meat each, though the crew ate even the bones, and, along with the second tin of turnips lasted until 15 or 17 July. The crew consistently failed to catch any rainwater and by 13 July, with no other source of fluid, they began to drink their own urine. 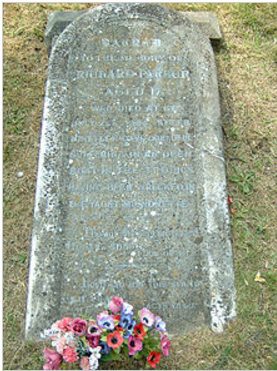 It was probably on 20 July that Parker became ill through drinking seawater. Stephens was also unwell, possibly having experimented with seawater. In some of the varying and confused later accounts of the killing, Parker murmured, "What me?" as he was slain. The three fed on Parker's body, with Dudley and Brooks consuming the most and Stephens very little. The crew even finally managed to catch some rainwater. Dudley later described the scene, "I can assure you I shall never forget the sight of my two unfortunate companions over that ghastly meal we all was like mad wolves who should get the most and for men fathers of children to commit such a deed we could not have our right reason." The crew sighted a sail on 29 July.